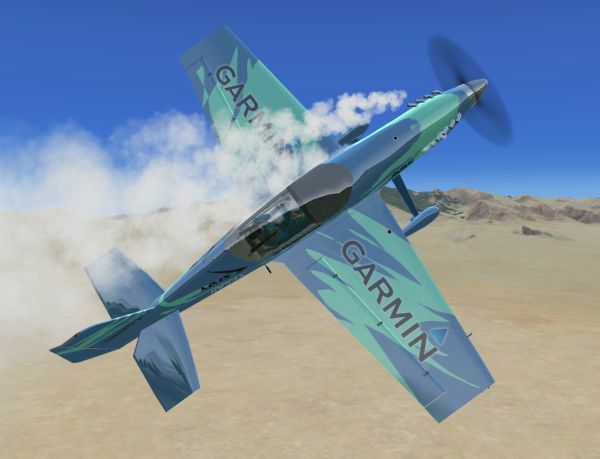 This is a custom shop repaint of the Aeroworks ARX-5X in a Garmin "ripped" scheme. Requires version 2.1 of the ARX-5X (ARX5XV21_JT.ZIP). Original aircraft and repaint by Jason L. Terry. 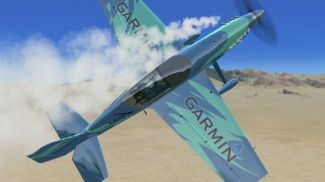 Screenshot of Garmin ARX-5 in flight. 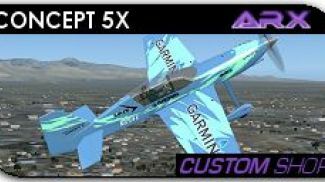 This skin works ONLY with the Model X, and is recommended for Version 2.1 for FSX released in 2012. It should work fine with version 2.0 from 2009 as both versions are FSX-native, but that version has been superseded by 2.1. This skin does not fit the FS9/FS8 Version 1. Copy and paste what is below into your aircraft config file, replace .x with the next number in your config file. description="N554X is a Custom Shop paint job created by Malibu Motorsports. The creators of the ARX-5. \n\nThe ARX-5X is a single-place aerobatic concept aircraft utilizing a metal tube fuselage with composite wings.\n\nThe X Model is built around the 600hp Trace V-8 aircraft engine and is thus designed specifically for freestyle (airshow) type aerobatic routines that require high torque and high levels of gyroscopic precession - i.e. tumbling! Although it can easily handle compulsory competition maneuvers as well.\n\nWhile it is not a real aircraft it does have several real world components such as the Trace OE-600 Engine, as well as the Sierra Flight Systems EAU (Engine Airdata Unit), and the Hartzell "scimitar" swept blade propeller. Includes a smoke system." The archive arx5x_n554x_jt.zip has 18 files and directories contained within it.